First Sentence: It was almost as if she were waiting, hanging there, in the painted darkness. Reason for Reading: Of the three Simon & Schuster selections that I recently received in the mail, this one sounded the most interesting to me. 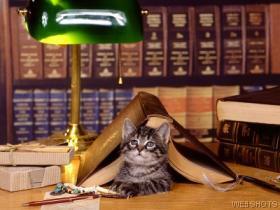 I am just about always ready to read a mystery novel. Comments: Father Amoroso is awakened at 3:15 in the morning and again just after 4 a.m. to what appears to be false alarms at Santa Giuliana church in Italy. When he opens the church at 8 a.m. the next morning, the Caravaggio altarpiece is missing. Meanwhile, Genevieve Delacloche of the Malevich Society in France discovers that a famous Kasimir Malevich painting is missing from the basement vault. Not too long after, two paintings similar to the one stolen in France, disappear in London, one from a museum and the other from a private citizen. Art investigator Gabriel Coffin is drawn into the investigations of the stolen paintings, his knowledge and skill proving to be invaluable to the authorities assigned the cases. Could these seemingly independent thefts be related? Is the culprit a part of a crime syndicate or instead an art aficionado? Author Noah Charney's knowledge of art history and art crime is evident throughout the novel. He crams quite a bit of information into the mystery novel and for the most part succeeds at avoiding making it seem like homework, his wit and presentation doing the trick. The Art Thief is full of colorful characters, each with their own quirks. It takes some mental focus to avoid getting tangled in among the many different story threads and characters. Unfortunately, with so many characters, it was hard to get to know any of them too well. Though perhaps this helped in keeping the reader at a distance from what would come. When the pieces begin to come together and the stories begin to overlap, it is in surprising twists that even I did not completely see coming. 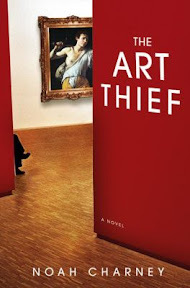 The Art Thief offers suspense, mystery and intrigue, taking readers on a tour of the art world and the crimes therein. It is a fast paced and enjoyable novel that will keep readers entertained and wondering what will happen next. Favorite Part: Dr. Barrow’s classes in the museum were by far my favorite part. I kept wishing he had been my art history professor in college. Check out the author's website for more information about his book and other projects. It sounds like a fun read. I love art and art history so I think I could get into it. Great review! I have been so intrigued by this book, and now with your review, I am going to have to pick it up! Great review. Sounds like a fun read. My TBR list just grows and grows. Thanks, Melody. I did enjoy it. Although I'm not very much into art, I find the history of it fascinating. Karen - It's worth trying. I hope you enjoy it if you do decide to read it. BookGal - Thanks. LOL I know how you feel. My TBR collection is taking over my house. I just hate it when a good book is bogged down with too many people! I usually hate books with lots of art references (art, being a visual medium loses something when put on the page), but you make this sound pretty interesting. BookSense recommends it too, so I'll have to give it a look. Thanks. I love Art History as well, and I did see this book on the shelf when I was browsing at the bookshop this morning. I seriously thought about buying it, but I already had my one allowed new book in my arms. So one of them had to miss out. The Art Thief missed out. I will wait for it to show up at the library, or on sale, but I do want to read it. Historia - I completely understand. :-) Waiting for the library copy makes perfect sense. Sounds like you and Malady (at Life by Candlelight) felt about the same about this book. I think I might read it next, if only for the art history. Thanks! Excellent review, as always! As I am pretty much interested in arts, I love booksrefering to that. It sounds fine tome. I should go for it. Gautami - I hope you enjoy it if you do get a chance to read it! This one sounds like a fun time. I'll put it on my TBR list. Carrie - It is a fun book. I hope you will enjoy it if you read it. Too many metaphors that stop me in mid sentence1 A whole speech inserted in a chapter! Where was the editor?